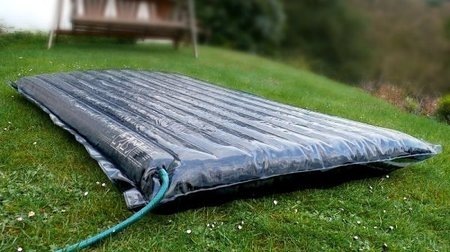 The SolarStore backpackers can be used to store daily around 3 full tanks of water while heating the water concomitantly. It’s very easy to use and you can fold it and store it with a few simple moves. For the future, the SolarStore panels will provide solar energy and heated water for people with low income or third world housing. These backpackers are produced by IDC that has a plan to mass-produce a cheap inflatable solar panel. You will pay for it $200 and no doubt it will work for its money. 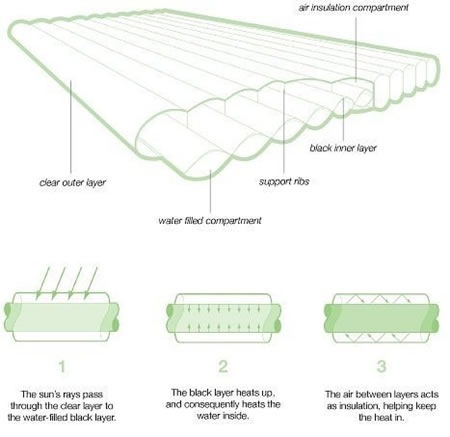 The SolarStore uses entirely the sun power and heats water coming into the PVC chambers, maintains the heat thanks to the air chamber insulation and processes the equivalent of three hot water heaters full of water day by day. Another reason for you to buy this device, is the fact that it’s environmentally safe and it’s also energy saving.